Event planning & styling by A Little Character will save you time, money & stress – we love to work with our clients & their families to make sure your next event is unique to you & to ensure it’s about what you want, rather than what everyone else thinks you should have! See below for our affordable event planning & styling packages. - we put together an event run-sheet outlining everything! This includes all of the elements outlined in the package above plus we work with you in the final 2 months leading up to your evnet to help pull all your wedding elements together. We will be there every step of the way to make sure your event & the lead up runs as smoothly & as stress free as possible. and has everything you want, is a reflection of you/your corporation. And if you want a little bit of this, not any of that, and a hand with some of these - no problem. Let's catch-up for a coffee & a chat about what you need - we'd love to tailor a planning & styling package to suit you & your budget. Table flowers (based on 8 tables), bar top flowers & bathroom touches - including scented candles. Contact us now, to arrange a time to discuss your next event in person. So many names - so many possibilities. Our one of a kind rustic porch post wedding arbour is very popular and has been created from weathered old porch posts we found and turned into this beautifully romantic wedding ceremony arbour. 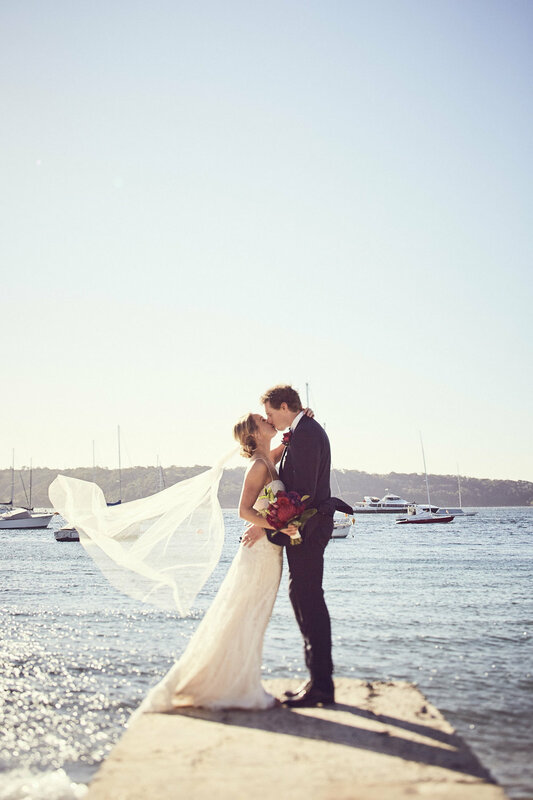 It has featured in & on the front cover of Modern Wedding magazine on a beautiful beach setting & also in White Magazine as seen above, for the luxe wedding of Alisha & Mikey. With or without our antique lace, the shadow patterns it casts are divine. 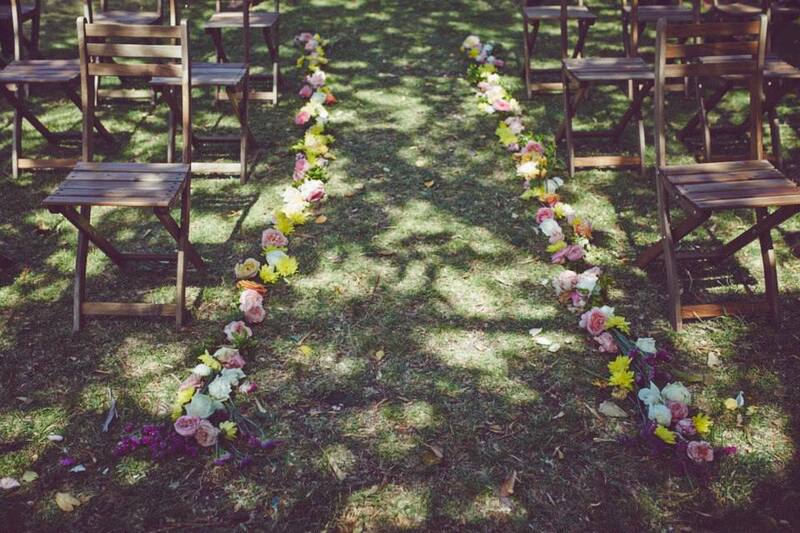 There is something so romantic about a ceremony under a wedding arbour, especially a grand old one such as this. Adorn it with flowers & foliage to really add to its beauty. The ladder arch is a great option for ceremony sites where councils won't let you erect a classic arbour as it doesn't weigh much and is very quick & easy to assemble - therefore it can also be hired & put up yourself. This is a delight to decorate as the ladder steps create shelves for flowers, candles, moss & foliage, and you can drape the structure with tulle, tie ribbons from it or decorate it with flowers and foliage - so many options. It also makes a fabulous backdrop for a feature table. This arch has been featured in Bride To Be magazine. We love creating special areas for your friends & family to leave their gifts & cards filled with love. We can pull together something special to you such as a typewriter for your guests to type out date night suggestions, or a 'message in a bottle' filled with words of love & advice. Making a lovely little spot for guests to be able to write in your guestbook always adds to the special notes left for you & your husband/wife to read later. We can also up the ante with a photo booth or polaroid guest book. Contact us to discuss ideas, availability & pricing. Nothing screams romance more than being surrounded by gorgeous flowers on your wedding day. From customised bouquets, floral displays to table decorations, we love being a part of the romance industry & creating unique floral designs for your big day - it's one of our specialities! From traditional to a more relaxed 'just picked from the garden' bouquet, flower crowns, and rose petals for your confetti. It's all about what flowers you love and how we can incorporate them into your wedding day. We're here to help your vision come to life. We want you to be just as excited about flowers as we are! Get in touch now and let's talk flowers & styling. Contact us for availability & a quote. Having a drinks table at your ceremony is a lovely way to celebrate with your guests straight after you say I Do, or even just to have some welcome refreshments for your friends and family before &/or after your ceremony. We can set-up & style a 'Help-Yourself' drinks table or a full service drinks station with bartender, glassware & ice. Drinks table packages from $350. Having a 'Help-Yourself' drinks table in addition to your bar is a lovely touch. We can also bring some styling touches for your main bar such as a drinks menu, custom napkins, paper straws etc.